Did the Vikings Beat the Pilgrims to Plymouth? There is a persistent myth in the vicinity of Plymouth Bay concerning Vikings. It appears in print, online, and is told and retold verbally. When I moved to this area nearly 20 years ago, it was one of the first bits of folklore imparted to me by local residents about the Gurnet. Named by the Pilgrim settlers, Gurnet Point (or simply, “the Gurnet”) lies at the entrance to Plymouth Bay. It is a high glacial drumlin at the end of a long barrier beach, presently occupied by a lighthouse and a cluster of summer cottages. The Pilgrims referred to it as the Gurnet’s Nose–apparently something about the shape of it reminded them of the fish of the same name. Numerous historians have asserted over the past two centuries, so strongly that the tale is accepted today by many as fact, that the Gurnet is the final resting place of Thorvald Eriksson, son of Erik the Red, brother of Leif Eriksson, who was allegedly killed by Native Americans on the Gurnet about 1004 and buried there. I have, for many years, wondered about the origin of this myth. It’s only recently that I really dug into it. So I here offer a bit of historiography on the evolution of a resilient bit of folklore. Leif’s brother Thorvald, after hearing of this success, decided he would lead an expedition of his own. The year was 1002. He and his crew reached Vinland safely and they spent about two years exploring parts of Vinland by ship, using Leifsbudir as their base. At one point they made landfall at “a point of land which was stretched out and covered all over with wood.” Thorvald took a look about and proclaimed, “Here is beautiful. Here I would like to make my dwelling.” But his plans were not to be. 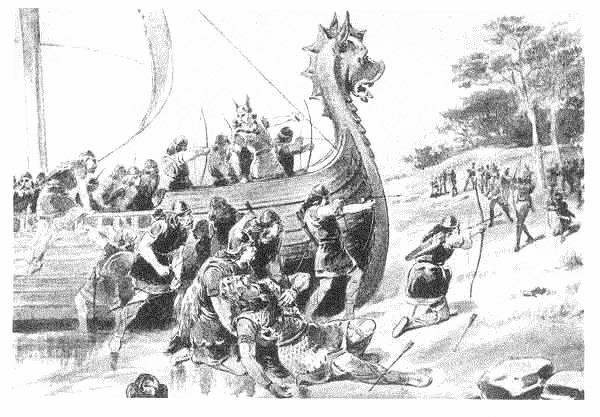 The Norsemen were soon attacked by Native Americans whom they called Skraelings. After the Native Americans were driven off, Thorvald collapsed, having been pierced by an arrow under his arm. Knowing it was a mortal wound, Thorvald asked his men to bury him on this beautiful promontory where he had hoped to settle, instructing them to place a cross at his head and his feet and declaring that the place should be called Krossaness. They did as he asked and then went home to Greenland. Some historians have pointed out that the Sagas, having been written about 200 years after these events took place, are unreliable. Certainly, I would think the finer details of the stories (and some historians have made much of these details) cannot be trusted as history. But I am willing to accept the bare bones as fact: Leif established a base in a North American location he called Vinland and his brother Thorvald died somewhere in the vicinity of this base on a promontory. One of the many details that 19th century historians took too literally is the mention of grapes after which Vinland was named. Many assumed that Vinland must be somewhere in southern New England as that is about as far north as grapes will grow naturally. In truth, Leif might have been talking about any variety of fermented berry. Possibly gooseberries or currants. The beginning of the great controversy in New England over Vikings was sparked by Danish historian Carl Christian Rafn (1795-1864). Rafn established the Royal Society of Norse Antiquities and dedicated his career to preserving and promoting Norse culture, mythology and literature. 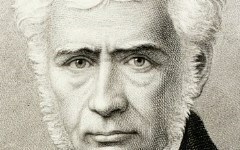 In 1837, he published Antiquitates Americanæ, the first modern translation of the Sagas dealing with North American exploration, along with his own commentary. In this work, Rafn concludes that Vinland included the coasts of Massachusetts and Rhode Island including settlements on the Charles River near Boston and Mount Hope Bay near Providence. He wrote that Krossaness where Thorvald was killed was probably Cape “Alderton” (Point Allerton in Hull on Boston Harbor) or the Gurnet. Next, Joshua Toulmin Smith published The Discovery of America by the Northmen in the Tenth Century in 1839. 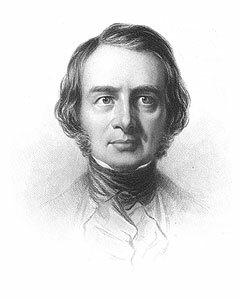 Smith (1816-1869) was an English lawyer and historian. Inspired by Rafn’s work, he set out to provide a more accessible version, not only by translating Rafn’s findings into English, but by couching them in a readable, fictional format as a conversation between Mr. Norset, a man exceedingly well versed in Norse history, and Dr. Dubital, who at first refuses to believe that Columbus was not the first to “discover” America but who soon becomes enthralled by Mr. Norset’s tales of Viking adventures in New England. Smith repeats Rafn’s assertion that Krossaness was either Point Allerton or the Gurnet…but leans a bit more towards Point Allerton. Throwing fuel on the fire in 1841, none other than Henry Wadsworth Longfellow bought into Rafn’s theories and wrote his curious poem, “The Skeleton in Armor.” The poem refers to a mysterious skeleton unearthed in Fall River, Massachusetts in 1832. “Armor” is really stretching it. The skeleton wore a brass plate on its chest about six by thirteen inches, probably something decorative fashioned by a Native American out of brass obtained from English colonists. Hardly Viking armor…but Longfellow played it for all it was worth. He bids the skeleton speak, and its spirit answers, “I was a Viking old! My deeds, though manifold, no Skald in song has told, no Saga taught thee!” The skeleton goes on to say that he came to these shores with his young bride and, of course, built the Newport Tower (a stone ruin in Newport, Rhode Island promoted by Rafn followers as a Viking site but almost certainly the remains of a 17th century windmill…different story). The skeleton, by the way, was kept in the Fall River Town Hall and burned in an 1843 fire. Therefore no modern analysis is possible. So, thanks to Longfellow, the concept of Vikings in New England entered popular culture and now we’re off to the races. Many proponents of the theory start pointing to possible Viking artifacts and settlement sites throughout Massachusetts and Rhode Island over the next 80 or so years including Dighton Rock, the Noman’s Island Rune Stone and, of course, Thorvald’s burial site on the Gurnet. And let’s not forget Norumbega. This mythical “lost city” of the Vikings, supposedly located in New England, was the pet project of one Eben Norton Horsford (1818-1893). He was a successful chemistry professor at Harvard who invented double acting baking powder, a discovery which made him fantastically wealthy. When he retired, he had no shortage of time and resources to promote his theories of Viking settlement in Massachusetts. Horsford located a stone foundation not far from his house in Cambridge, inexplicably proclaimed it the remains of Leif Eriksson’s house and had a plaque placed there which still stands. He then announced that a field of scattered rocks near the Charles River in Weston, Massachusetts was the site Norumbega and erected a stone tower there, calling it Norumbega Park. 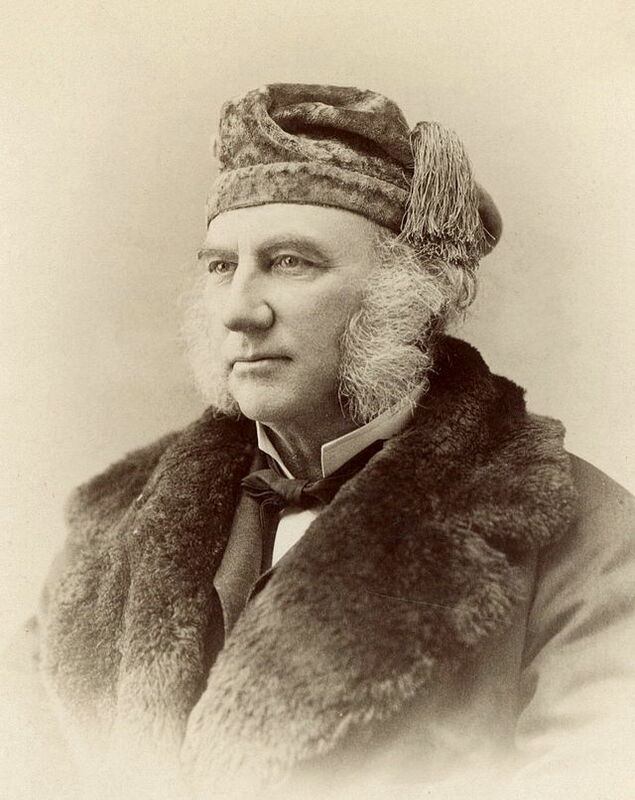 And when the effort to erect a statue of Leif Eriksson on Commonwealth Avenue in Boston (of which one of the original proponents was Henry Wadsworth Longfellow) stalled largely due to tremendous criticism from established historians, Horsford adopted the project and pushed it through to completion in 1887. Getting back to the Gurnet, Horsford stated unequivocally in more than one of his many books defending his Viking settlement theories (published in the 1890s) that Krossaness, the site of Thorvald’s demise, was Gurnet Point. The refrain, thus revived, was taken up by others and so the myth persisted. The evidence upon which modern defenders of the narratives rely is that offered by the Sagas themselves. I have no space here to discuss the character of these documents. It is possible only now to say that…the data which they offer for the identification of places are considered by many scholars as too slight to warrant the conclusions sometimes drawn from them. The direction of the wind and the time occupied in sailing from point to point are not enough to prove the exact position of the place reached. The descriptions of the countries are not thought by all to be applicable to New England…While, then, it is very probable that the Northmen reached America, it is not safe to assert that they discovered Massachusetts Bay, much less so to say that Thorvald, Erik’s son, was killed at the mouth of Boston Harbor. It could not have been better put. The geographical references in the Sagas are so few and so vague, it is simply impossible to use them for a basis of determining the location of Vinland and certainly not the precise spot of Thorvald’s death. In 1960, Norwegian explorer Helge Ingstad and his wife, archaeologist Anne Ingstad, led an excavation at a site in Newfoundland known as L’Anse aux Meadows and found definitive proof of a Norse settlement there. It is now generally accepted that Leif Eriksson’s Vinland was located in Newfoundland. The location of Thorvald Eriksson’s death will likely never be known, but it was probably somewhere in Newfoundland or nearby. Unless someone turns up another skeleton in armor…real armor…there is no evidence whatsoever of Vikings in Plymouth Bay.